Workers at the Sellafield plant in Cumbria have told the Prime Minister that they should be at the centre of a new nuclear future for Britain. 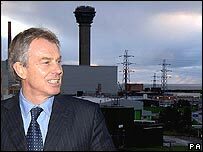 Tony Blair visited the plant on Tuesday, at the invitation of the Sellafield Trades Unions, following a meeting at the GMB annual congress. He toured the site, addressed the workforce and met community leaders and trade union officials. Union bosses also asked him to support the building of two new reactors. They also requested a public inquiry on discharge levels from Sellafield to help the site win reprocessing work. Gary Smith, GMB national officer, told Mr Blair that Sellafield should manufacture the next generation of nuclear fuel. He said: "It should burn that fuel in these new reactors and should reprocess spent fuel as well as being the core centre of excellence for decommissioning existing nuclear power stations in Britain and overseas." Around 10,000 jobs are likely to go at Sellafield in the next 10-15 years as the decommissioning process comes to an end.